The Atkins-designed InterContinental Shanghai Wonderland hotel opened on 15 November 2018. 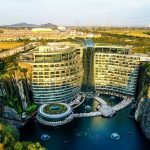 Atkins, a member of the SNC-Lavalin Group, was appointed by Chinese developer Shimao Group to apply a visionary architectural approach in order to transform an 90m deep abandoned quarry to a unique luxury hotel. SNC-Lavalin acquired WS Atkins plc on July 3, 2017. Often referred to as the “Quarry Hotel”, the design of the InterContinental Shanghai Wonderland hotel aims to create a unique destination that reflects the natural landscape of the quarry. Inspired by the stunning location and the natural environment of the rocky cliffs, waterfalls and surrounding hills, the 18-story hotel has two floors above ground, and 16 below ground—including two floors that are underwater. 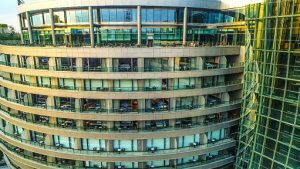 Key design features, such as a cascading glass waterfall and exposed rock surface, enable the building to fit seamlessly into the surrounding environment, which enhances the eco-friendly quality of the building through maximising the utilisation of geothermal and solar energy. The unique design was honoured by multiple prestigious awards, including “Best Chinese Futura Projects Awards by MIPIM Asia 2011 as well as “Best Hotel Architecture China”, “Best Hotel Architecture Asia Pacific” and “Best International Hotel Architecture” by International Hotel Awards 2013. Atkins has delivered many of the world’s and region’s most iconic architectures including the 7-star Burj Al Arab, the 568m supertall “Pearl of the North” in Shenyang China, and 462m Landmark 81 that defines the emerging skyline of Vietnam’s capital city Ho Chi Minh City.